Put yourself to the test – try this challenging via ferrata & climbing activity which requires balance, nerve and coordination. Set in the beautiful Yorkshire Dales, the high wire course of cables, ladders and beam crisscrosses through How Stean’s Gorge – only feet from the car park. Each element requires different skills which make it’s fun and exciting. You will always attach yourself to the cables with cow tails and carabiners – so you’re absolutely safe. Depending on the size of your group the Via Ferrata can take anywhere from 1hr to 2.5hr to complete. We will then head to our climbing quarry to test your skill taking on some top rope climbing or maybe even a free hanging abseil down to the gorge. ‘Via Ferrata’ is literally ‘iron way’ in Latin. It was originally used as a safe system of climbing across rocky surfaces and getting people from one location to another. Ferratas were first built for soldiers to climb to access vantage points in the mountains of Europe during the war. Although Via Ferrata is often associated with parts of the Alps such as The Dolomites or Chamonix, it didn’t take long for the UK to understand the thrill and start making use of our beautiful countryside with our own Ferrata routes. 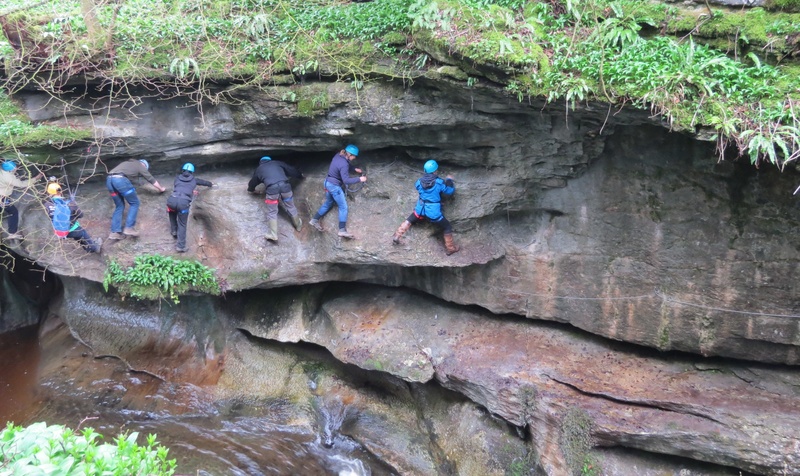 How Stean Gorge have 1 of only 3 courses in the UK and the only Via Ferrata in Yorkshire! The Via Ferrata is now only run as the How Stean Experiance. A four hour session of Gorge Walking and Via Ferrata. After a briefing, you will put on a climbing safety harness and helmet. You’ll then start your adventure on the practice course learning all the skill required to keep you safe along the journey. You will learn how the ‘buddy’ system enables you to work together with your fellow adventurers. Now it’s time for the ‘real thing’ where your balance skills will be put to the test. First, you cross the beam over the gushing water below – do look down! The next stage is to traverse the gorge walls using a network of metal cables. This includes a number of aerial cables spanning the gorge. The first being a Postman’s walk (one top cable and one cable to walk on), next it’s the Burma Bridge (two hand cables and one foot cable). Finally, you’ll negotiate your way across the Tyrolean Traverse (a top cable, with pulley to move across the gorge). This 3 hour experience costs £45 per person with sessions starting at 09.30 am and 2pm daily. We run sessions on Friday and Saturday evening for groups of 10 6pm – 9pm at a special price of £400. Please arrive approximately 30mins early to complete medical forms. You will need to have a basic fitness level to participate in this session. You will be safely cared for by our professional experienced instructors who use How Stean Gorge for activities on a daily basis. 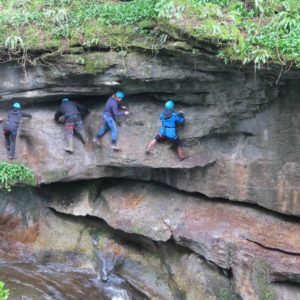 How Stean Gorge is a spectacular limestone ravine that continues to be carved out by waterflow and is the perfect location for outdoor activities like via ferrata, gorge walking, caving, rock climbing, canyoning and abseiling. It is geographically unique, as it’s one of the only places in the UK where you can comfortably enjoy both rocksports and canoeing – in a single day. It is also a Site of Special Scientific Interest in Nidderdale, An Area of Outstanding Natural Beauty – why choose anywhere else? Of course! Anybody aged 7 or over can take part, with a lower height limit of 1m 40cm. Those who do not take part can watch from the bridge, while away the time exploring the gorge and caves tourist attraction or enjoying refreshments in our onsite café. All groups and individuals are welcome to tackle the Via Ferrata and Climbing course. No minimum number to book, just make sure you book in advance. It’s great fun for stag does, hen parties and groups of friends and family. We recommend you wear comfortable clothes you don’t mind getting dirty and trainers. You will be brushing the gorge walls during the activity so get ready to get dirty. Please bring along a waterproof coat and trousers just in case of rain. You can use our hot showers and changing area afterwards so don’t forget a towel. We supply all safety equipment.